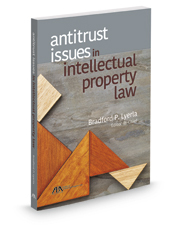 Published by the American Bar Association (ABA), Antitrust Issues in Intellectual Property Law focuses on recent developments, helping the IP practitioner stay informed about the law and the many ways in which antitrust law limits, disciplines, and counterbalances intellectual property law and vice versa. The intersection of intellectual property law and antitrust law is busy and complicated, and there's no reason to believe that the heavy traffic will abate anytime soon. Recent examples show how significant statements from congress, regulators, and courts affect the historical balance between the competing policies underlying intellectual property and antitrust law.